Those of us who treasure Montana’s great outdoors—our hunting, fishing and recreational heritage and public lands legacy—know that we must have people in the state legislature and in Congress who can knowledgably and enthusiastically work for, and when necessary defend—those resources. Kathleen Williams has the policy experience and ability to act on behalf of Montana’s outdoor heritage in Washington D.C. Her work, both in her long career in public resources as well as in the Montana legislature, has yielded solid, tangible results, not just empty partisan rhetoric. She has a proven track record of working with a wide range of interests and people civilly and productively and has done so with the best interests of all Montanans foremost. As a staunch defender of our public lands she has fought vigorously against transparent efforts to move them into private ownership, which would deny all citizens access to that magnificent legacy. She understands the larger, long-term view and remains an ardent advocate for those boundless resources. We need a voice in Congress that is one of us, who can speak for the resource concerns of all Montanans, whether from the tall mountains of western Montana or the shortgrass prairies of the east. 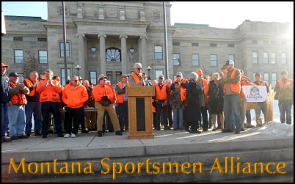 The Montana Sportsmen Alliance PAC whole-heartedly supports Kathleen for US Congress.